Work began on the R-34 on 9 Dec, 1917 and she was completed the following December 20th, 1918. Bad weather prevented her from making her first flight till 14 March, 1919. She was 643 feet long, 78.75 feet in diameter, had 5 engines and could carry a normal crew of 22. Her design was based on the captured German Zeppelin, L33, with up-to-date modifications based on the design of the German L-48 captured in June, 1918. Her hull was of duralumin girders with extensive wire cross-bracing. She had 19 chambers for gas-bags, each with automatic pressure release valves. The forward, control gondola was of two parts - the front section housing the controls, and the rear section the "wireless" room. As with many airship designs of this era, a triangular keel ran the full length of the hull, Within this keel was a 1 foot wide catwalk which allowed crew access to the engines, and the bow and stern. After the trial flight on 14 March, 1919 which lasted 5 hours, extended trial flights were conducted the 24-25 March. She made a 21 hour test flight at the end of May, 1919. A 6 hour flight was made on 15 June, followed by a 56 hour flight from 17-20 June and covered 2000 miles. 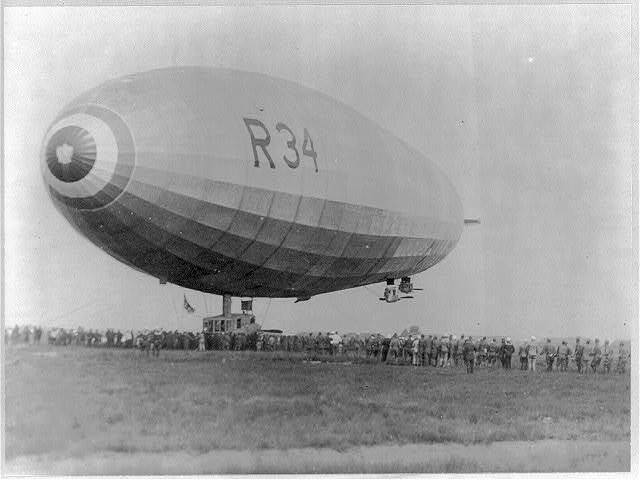 Sometime toward the end of 1918, the Admiralty offered the R-34 to the Air Ministry for tests as a civil transport, and the idea surfaced for a transatlantic flight. After much negotiation, and overcoming many problems and concerns about cost and handling the airship in America, the trip was made. The round trip was begun on 1 July, 1919. She landed in New York on 6 July after 108 hours, 12 minutes of flying time. She had only 140 gallons of fuel remaining - enough for about 2 hours more flying time. The return flight began near midnight of 9-10 July after hurried preparations due to forecast high winds the next morning. She arrived a Pulham at 06:20 on Sunday, 13 July, 1919 after severely struggling with engine problems on the return trip - only 2 of the 5 engines still running! She touched down at 06:57 after 75 hours, 3 minutes flight time. She had completed the world's first round trip Atlantic crossing by air. She made a few more flights in the local area through the end of 1919, and was transferred to Howden in March, 1920. 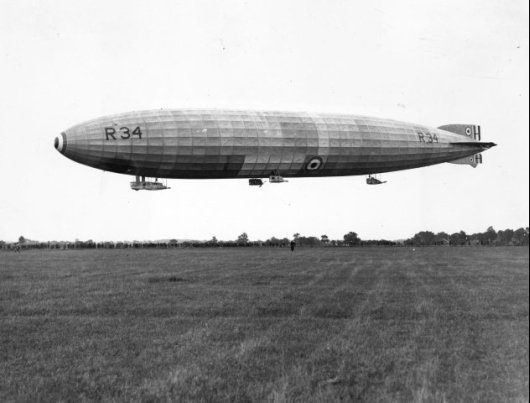 On January 27th, 1921, after having been stationed at Howden, the Royal Naval Air Station famous for building the R-100 (see ZR-2 and R-100 on this web site), after a long day on a training mission, confused radio instructions, and deteriorating weather, the R-34 suffered an unfortunate accident which heavily damaged the forward gondola and the propellers on several engines. Over the next 48 hours, she limped toward Howden, only to have her bow smashed in a gale and be damaged beyond repair. There is a great summary of the final flight at the Airship Heritage Trust website. After she reached Howden, strong wind gusts prevented her from being hangared. Gales lifted her and slammed her repeatedly into the ground. Over night while tied in-place, she lost lifting gas and she remained on the ground damaged beyond repair. On 30 January, 1921, As she lay crippled on the ground, she was stripped and dismantled and the remains sold for scrap. 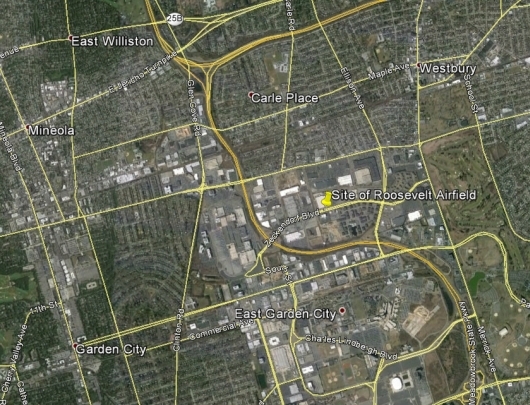 This next image is from Google Earth, showing the location of Roosevelt Airfield - today's location of "East Garden City, New York" - the famous flying field now long gone. The map tack above is at (Lat Lon) 40.740704 -073.600561, (Click here to View in Google Maps). But here is a very nice way to visualize where the Airfield once was. Reproduced below is the same Google Earth image, but now, put your mouse cursor over the photo and it will overlay with an image from a 1918 USGS topographical map of the area. 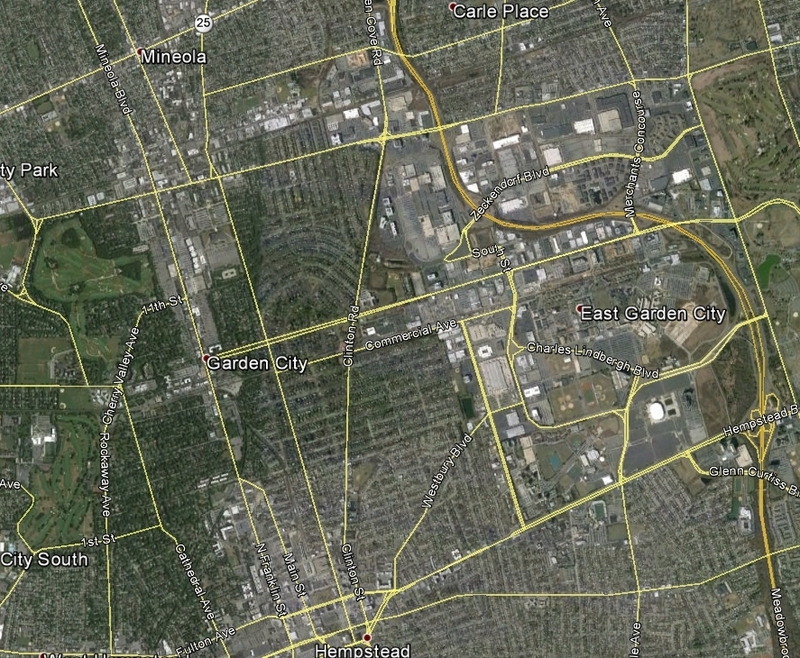 Move your mouse onto and off of the image to alternate between the 1918 view and today's view of the area. Look for the roads which still today, match! 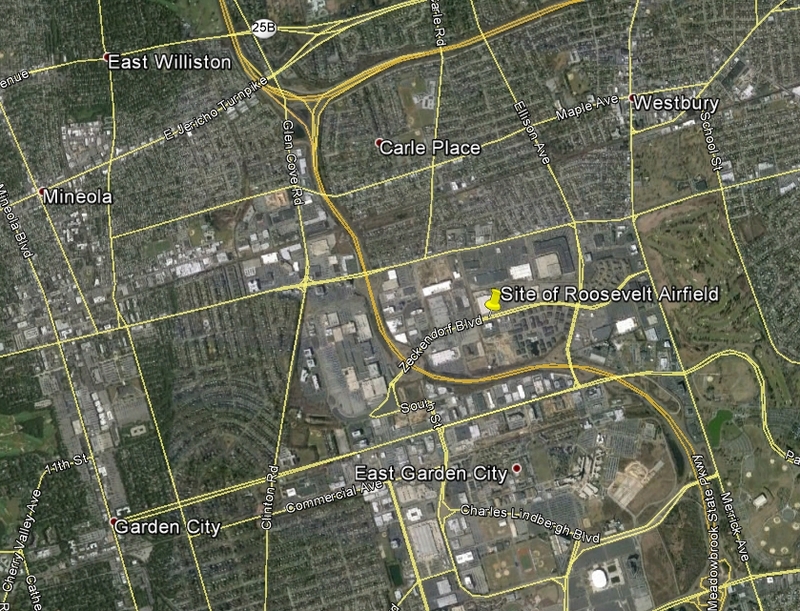 (I am not a cartographer, so I did not spend time precisely aligning the 1918 map with the Google Earth image. Nevertheless, I think you can see it is pretty much "dead on".